The cheetah (Acinonyx jubatus) is a species in the Felidae family of cats. Four African subspecies exist, differentiated based on the regions of the continent where they occur. The Asiatic cheetah (Acinonyx jubatus venaticus) was once common across Asia and India. The animal's common name is taken from "chita," a Hindi word meaning "spotted." Historically, cheetahs lived throughout the African continent, India and the Arabian peninsula. Modern cheetahs are restricted to sub-Saharan Africa, where they live in small populations that are increasingly isolated due to habitat loss and human incursion. Cheetahs prey on hoofed animals, primarily gazelles and wildebeests that graze in open savannas, although they also take down smaller game. 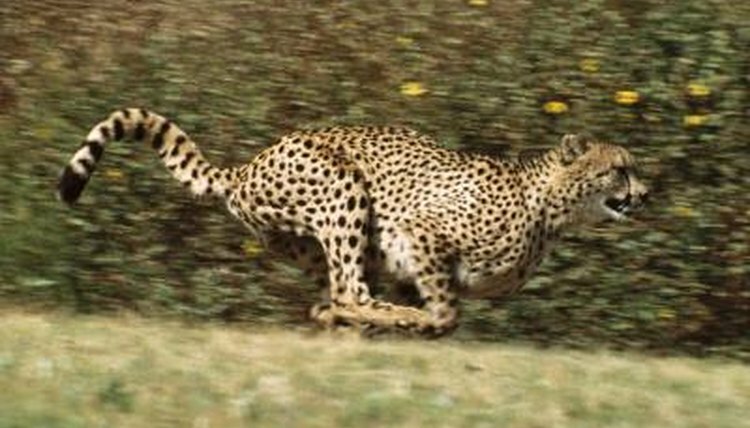 The sleek cheetah is built for high-speed sprints, not for power like the leopard and other big cats are. They average 3.5 to 4.5 feet long from nose to rump and stand 2 to 3 feet at the shoulder. The cheetah’s slim legs are proportionately longer than those of other big cats. They weigh between 75 and 145 pounds, males tending to weigh more than females of similar size. The cheetah’s coarse, smooth fur is a pale tawny base covered with simple black spots of irregular shape and occurrence. Black stripes of fur known as “tear lines” frame the cheetah’s face from the outer corner of its eyes down its nose to its mouth. These dark stripes keep the sun out of the cheetah’s eyes when it is hunting. The simplicity of a cheetah’s spots distinguishes it from the leopard. Leopards have more complex coloration, with black and brown clusters of spots called rosettes. The carnivorous cheetah preys on gazelles and other hoofed mammals. Unlike other big cats, the cheetah does not stalk and pounce on an unsuspecting animal in close range. Rather, the cheetah charges from 200 to 300 feet away, outruns and overtakes the exhausted animal. Cheetahs can achieve speeds beyond 50 miles per hour during these short sprints. To avoid larger predators, cheetahs do most of their hunting during the day. Despite their best efforts, bigger cats like lions often usurp the cheetah's prey. Cheetahs are considered the second most social of the big cats next to lions. Males form coalitions, permanent territorial groups typically including two to four brothers. When coalition members are separated, they will call to each other until reunited. Female and some male cheetahs are solitary and nonterritorial. Cheetah cubs are weaned as early as 3 months but remain with their mother until 15 to 17 months of age. Between 8,000 and 10,000 cheetahs live in the wild, according to the Smithsonian National Zoological Park. The International Union for Conservation of Nature lists cheetahs in sub-Saharan Africa as vulnerable; two subspecies, the Asiatic cheetah and the northwest African cheetah, are critically endangered. Despite their vulnerable status, national laws provide limited quotas for the killing of cheetahs in Namibia, Zimbabwe and Botswana, where the cats attack domestic livestock. Habitat destruction is the main threat to cheetah survival. Mental Floss: Cheetah vs. Leopard -- What’s the Difference? What Is Similar to a Cheetah?